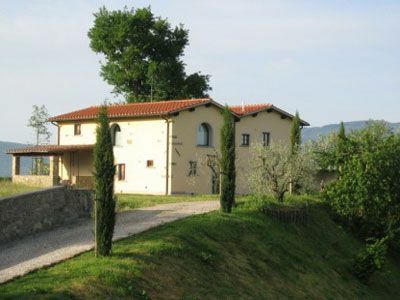 Agriturismo Il Chiuso is carefully restored ancient farmhouse situated on a rolling Mugello hill at just 3 kilometers from Vicchio, the land of Giotto and Beato Angelico. Florence is not far off and easily reached by train, bus, or car along a 35 kilometer stretch of enchanting countryside. The farmhouse, which stands among olive and cypress trees, is made up of 4 apartments, completely furnished in Tuscan style furniture. Since 1967 our farm has been producing peaches and extra virgin olive oil. In particular we produce a renowned quality of peach known as the "Regina di Londa". Agriturismo Il Chiuso is located at just 3 kilometers from Vicchio, the land of Giotto and Beato Angelico. The farmhouse offers a wonderful view on the countryside and on the Appennino Mountains. In Vicchio di Mugello, only 3 km away, there are all kind of shops and services, supermarkets, a train station, a pool, tennis courts, restaurants and horseback riding. Vicchio di Mugello, 3 km from the farmhouse.